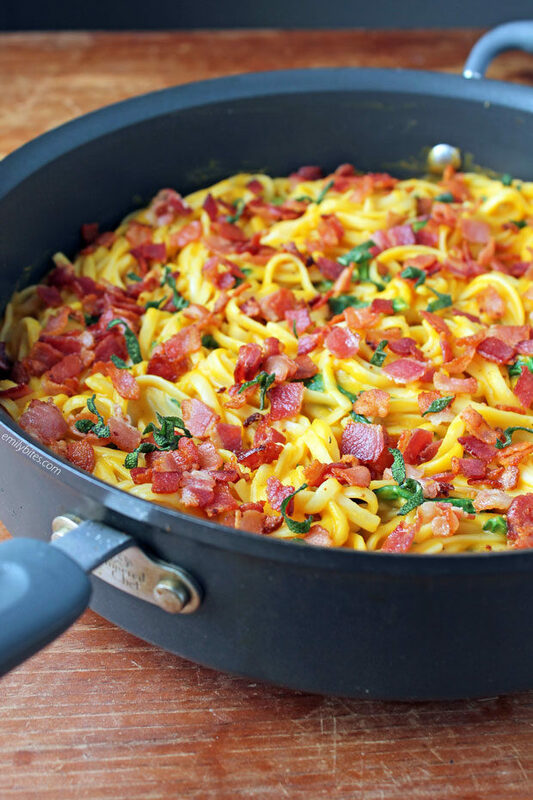 This Butternut Squash Pasta with Bacon tastes so decadent, creamy and savory, you’ll never guess it’s lightened up! This dish is perfect for fall and a great way to use one of my favorite pieces of seasonal produce, butternut squash. The hint of sweetness from the squash pairs perfectly with smoky bacon and salty parmesan cheese and makes for a rich, creamy sauce without any need for cream or butter. 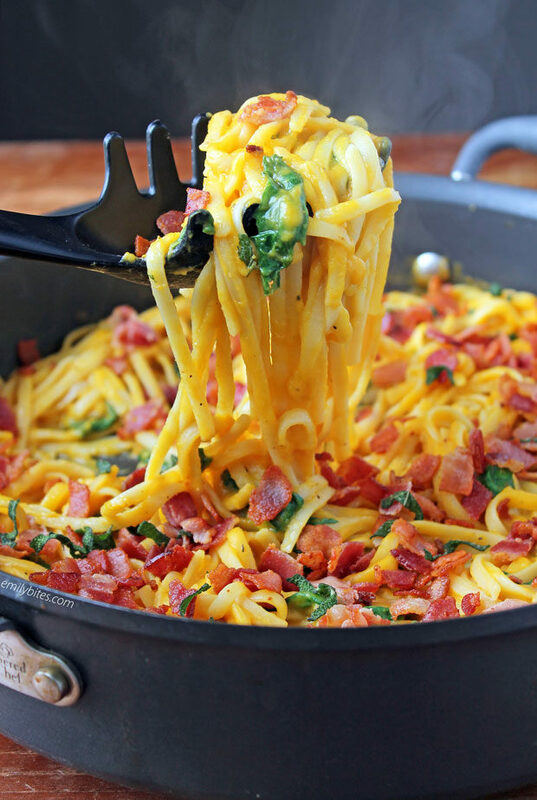 I like to serve this Butternut Squash Pasta with Bacon with a side salad, but it’s also good with extra roasted veggies tossed right in with the pasta! 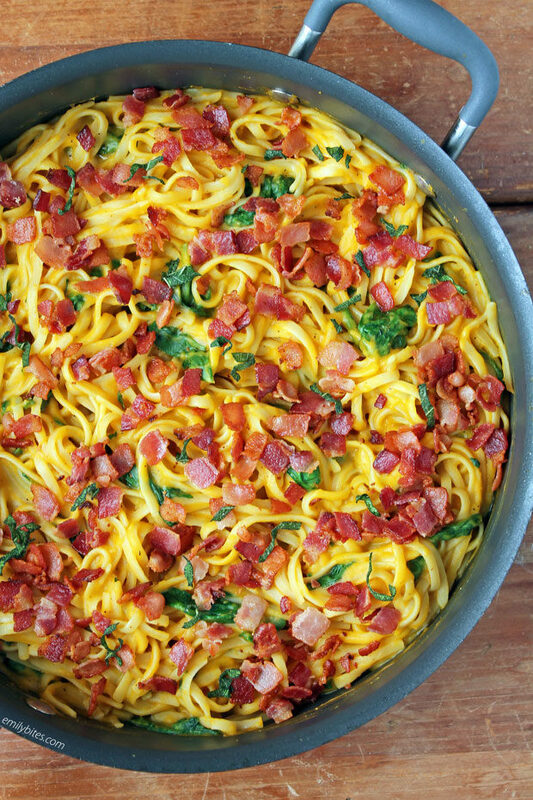 As indulgent as this pasta tastes, you’ll be happy to know that a cup of this tasty pasta dish is only 238 calories or 6 Weight Watchers Freestyle SmartPoints! If you love butternut squash like I do, you also must try my Butternut Squash Soup. It’s one of my absolute favorite soup recipes and I know you’ll love it too! Peeling, cutting and chopping up a butternut squash can seem intimidating, but I promise it’s not as bad as you may think. I always stab my squash with a fork a few times and stick it in the microwave for 2-3 minutes to soften it up a little first. Then, I cut the stem and the very bottom off with a sharp knife and then cut the top (longer part) of the squash off of the bottom (rounder part where the seeds are). Then, just use a serrated peeler to peel both pieces and a sharp knife to chop them up! When you cut the rounder part in half you can scoop the seeds out with a spoon before chopping. You could even do a few squash at a time to get it over with and then freeze the squash cubes so you have them for recipes in the future. Not bad! If you’re looking for more tasty, lightened up pasta dishes, check out my Chicken Pot Pasta, Pumpkin Alfredo Tortellini Skillet, Beef Enchilada Pasta Skillet, Turkey Sloppy Joe Pasta, Italian Wedding Pasta Skillet, Sausage Ricotta Pasta, Lemon Chicken Orzo, Beef Stroganoff, Beefy American Goulash, One-Pot Cincinnati Chili Spaghetti Bake, Slow Cooker Kickin’ Chicken Pasta, Cheesy Chicken Veggie Pasta Skillet, Sausage Tortellini Skillet, Spaghetti Pie, Spicy Sausage Pasta and so many more in the Pasta category of my recipe index! Place the chopped bacon in a large saute pan and bring over medium heat. Cook, stirring occasionally, until the bacon is crisp. Using a slotted spoon, transfer the bacon to a stack of paper towels to drain. Discard the bacon grease and wipe the pan clean. Add the olive oil to the saute pan and bring over medium-high heat. Once the oil is hot, add the sliced sage and toss in the oil. Cook for 1 minute and then use a slotted spoon to remove the sage to the paper towels to drain. Add the onion and squash to the oil in the pan and sprinkle with salt and pepper. Stir to coat and cook for about 7 minutes, stirring occasionally. Add the garlic, stir and cook for another minute until the garlic is fragrant. Add the broth to the pan and bring the contents to a boil. Cover the pan and reduce the heat to a simmer for 15-20 minutes until the squash is tender. When the squash is tender, allow it to cool for a couple minutes and then transfer the contents of the pan to a blender. Puree in the blender until smooth and combined. Add salt and/or pepper to taste if needed. Combine the cooked, drained pasta, the squash sauce from the blender, ¼ cup of the reserved cooking liquid and the fresh spinach back in the saute pan and stir. Cook over medium heat, stirring occasionally, for 2-3 minutes until the spinach is wilted and the contents are heated through. Add additional reserved cooking liquid as desired for the sauce to coat the pasta (I added another ¼ cup or so). Stir in the parmesan cheese until melted and well combined. Top with the bacon and sage and serve. My son and I made this last night for dinner and loved it! My husband liked it as well. Just more proof that everything is better with bacon. And I love pasta in all forms. I love that you are unafraid to include bacon in healthy recipes! I have long avoided it as a “forbidden food”, but I am learning to include it in my cooking- in moderation, of course! This was delicious! My fiancé said this was the best pasta dish I made this year. He had to go back for seconds! Wow, this is fabulous as I knew it would be. And I don’t even like veggies. Has anyone tried this with butternut squash zoodles?